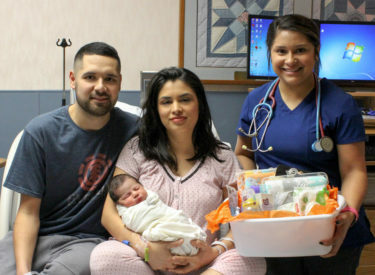 Southwest Medical Center celebrated the arrival of Liberal’s first newborn of 2019 on New Year’s Day. Sebastian Muñoz was delivered by Dr. Dennis Knudsen at 1:14 p.m. on Jan. 1. He weighed in at 7 pounds, 12 ounces and measured 20.5 inches in length. Baby Sebastian was born to Haydee and Benjamin Muñoz of Liberal. Both parents work as registered nurses at Southwest Medical Center. Sebastian has an older sister, Melody, age 2. His grandparents are Mauricio and Betty Zeledon, and Benjamin and Bertha Muñoz. The team at Southwest Medical Center cared for 741 total newborn deliveries in 2018.